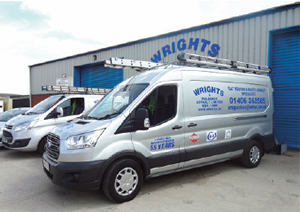 Established in 1959, Wrights and Holbeach Asphalt Ltd. are flat roofing specialists based in the market town of Long Sutton in South Lincolnshire. Serving the Lincolnshire, Cambridgeshire and Norfolk towns of Long Sutton, Holbeach, Spalding, Wisbech, Boston, Kings Lynn and Peterborough, we have built up an enviable reputation for personal, friendly, customer service, quality workmanship and competitive prices. Remaining a family run business, spanning four generations, we work alongside builders, Housing Associations, Health Authorities, Local Authorities, Drainage Boards, Schools and Colleges as well as the general public. We offer high quality flat roofing solutions to a vast array of specifications and industries. From domestic applications to architect specified, industrial and commercial ventures. As Polyroof and D.O.E.approved contractors we cover all aspects of fibreglass roofing inc; flat roofing, porches, balconies orangeries and valley gutters and like our 3 layer high performance systems, all come with an insurance backed 20 year guarantee. We are also the only company in a 60 mile radius who are mastic asphalt specialists, carrying out roofing and balconies, damp proof flooring and tanking solutions. For a competitive quotation call us now on 01406 362 585 or email: . Wrights & Holbeach Asphalt Limited.